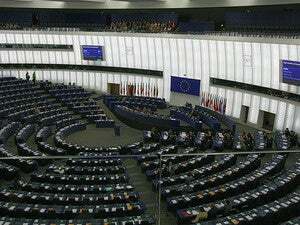 Companies that host or operate websites should be held criminally liable if they fail to remove content that incites terrorism, members of the European Parliament voted Wednesday. But they also want these companies to voluntarily cooperate with governments to promote "anti-radicalization messages." MEPs voted on a report written by former French Minister of Justice Rachida Dati for Parliament's Civil Liberies, Justice and Home Affairs Committee (LIBE), which included a chapter on preventing online terrorist radicalization. While it might look like a knee-jerk reaction to the terrorist attacks in and around Paris on Nov. 13, the report is actually -- as Dati herself explained -- a response to the attack on the office of satirical magazine Charlie Hebdo in January. The report, "On prevention of radicalisation and recruitment of European citizens by terrorist organisations," has no legislative value but shows the European Commission how Parliament would vote if the Commission were to propose legislation in this area. Under European law, Internet companies and service providers are responsible for deleting any illegal content that spreads violent extremism. Dati and her fellow MEPs want to make ISPs and website operators and posters criminally liable if they don't follow that rule. "Member States should consider legal actions against Internet companies which refuse to comply with an administrative or judicial request to delete illegal content on their internet platforms," she wrote in the report. "Refusal or deliberate failure by Internet platforms to cooperate, thus allowing such illegal content to circulate, should be considered an act of complicity that can be equated to criminal intent or neglect." The report calls for Internet platforms such as Google and Facebook to help spread anti-terrorism messages -- or, as she puts it, "to promote powerful and attractive narratives to counter hate speech and radicalisation online." Internet companies should make it easier for users to flag illegal content on social media networks and other sites, and report it to the relevant authorities, MEPs said. MEPs also want Internet platforms to work with a special unit within Europol, the EU's criminal intelligence agency, to promote anti-terrorism messages. Europol already has special units with related purposes, including the Internet Referral Unit responsible for detecting illegal content, the European Cyber Crime Centre (EC3) and the European Counter Terrorist Centre, due to open by the end of the year. The battle against terrorism isn't just about deleting propaganda, though: MEPs also want to gather more information and, most importantly, to better coordinate the sharing of the information they are already gathering. This is a recurring theme in the wake of the Nov. 13 terrorist attacks in Paris. Police and intelligence services in France and other EU countries were already watching the perpetrators of the attacks, but failed to join the dots when they apparently used their mobile phones to talk and message about their plans without using encryption. MEPs voted to give EC3 more resources for detecting and tackling online threats, and also to reorganize the EU's Situation Centre (SitCen) and the Intelligence Centre (IntCen) and make them work with the EU's Anti-Terrorism Coordinator. That vote highlights just what a mess things are in, as SitCen and IntCen are actually one and the same body: SitCen changed its name to IntCen in 2012. Other information-exchange measures voted by the MEPs included pushing for the speedy completion of an EU directive on retention of airline passenger name records by year-end. That issue has been dragging on for years. There's a host of other databases that MEPs want linked together, including the Schengen Information System (SIS) used to track visitors to the Schengen Area, composed of EU member states that have abolished internal border controls, and also VIS, which stores information about visas for visitors to this area. There's also Europol’s secure information exchange network application (SIENA) and Europol's 'Focal Point Travellers' focusing on European citizens who have been radicalized.